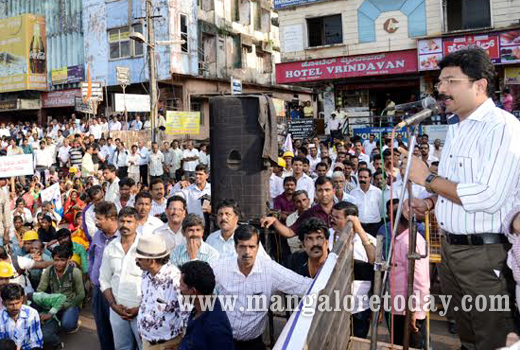 Mangaluru, March 22, 2016 : Civil contractors and construction workers took out a protest rally and held a public meeting on mar 21,Monday protesting against the DK district administration’s alleged apathy in making sand available to the people. “It has been 65 days that the construction industry is going without sand. 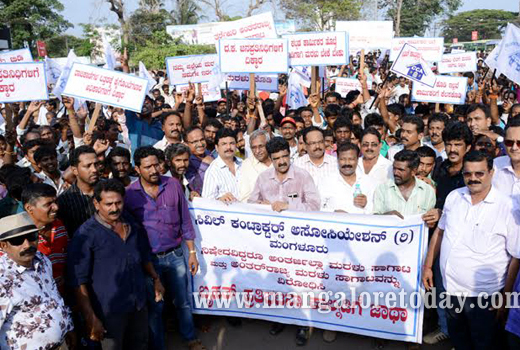 It has affected the livelihood of thousands of people, contractors, transporters, workers and their dependants,” M. Puturhottam Kottary, president of the Civil Contractors’ Association, Mangaluru, said. Addressing a public meeting outside the association’s district office here, Head of the association Kottary said that the administration would have to take the blame for the mess. Knowing well that sand extraction from the CRZ - Coastal Regulation Zone area would come to an end from January 16 following expiry of clearance given by the Union Ministry of Environment, Forest and Climate Change, the officials failed to do anything to get the clearance renewed, he alleged. Also, the Public Works Department, which had been assigned the responsibility of extracting and making sand available from non-CRZ areas, had just been buying time to implement action, Kottary alleged. He said that while the district administration had formally announced a ban on sand extraction and transportation from the CRZ area, it was being illegally extracted and transported to neighbouring States. As a result, the contractors had been affected, and thousands of workers who had been eking out a living in the industry and their dependents were facing problems. Despite the administration promising commencement of sand extraction in non-CRZ areas from March first week, nothing seemed to have happened, he said. Association secretary Devanand said that illegal and indiscriminate sand extraction in the CRZ area was bound to affect the fragile eco system in the coastal region. There should be a complete ban on not only inter-State, but also on inter-district transportation of sand, Association Sec Devanand said. At the same time, the administration should ensure sand was available to genuine customers within the district, he urged. Later, the association submitted a memorandum to the government. Even though work orders to extract sand from four blocks in non-coastal regulatory zone were issued last week, the Pubic Works Department is unable to get space to house stockyard to store and sell sand for general pubic. The department is unable to store sand on the one identified near Panemangaluru following public protest, said a source in the department. The department is scouting for another location, which is likely to be finalised by mar 22,Tuesday, sources said and added the stockyard should be as close as possible to Mangaluru.